Mammoth Cave National Park contains more than 70 miles of backcountry trails through forested Kentucky hills for hikers, horseback riders, and bicyclists. Several front country trails lead to special places like Cedar Sink, Sand Cave, and Turnhole Bend. Mammoth Cave is one of the oldest tourist attractions in North America. 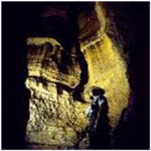 Tours of Mammoth Cave have been offered since 1816. Welcome to the finest Sweet Dark Chocolate anywhere. We've developed a special blend of chocolates that allow you to enjoy the rich, deep flavor of superior, dark chocolate without the bitter aftertaste. To further enhance your experience, we've employed a technique where the quality and taste of our fine liquors are not heat-affected. Currently, we have 23 fine flavors and counting. We're able to use any flavor desired, but we can't use a trademark name so special requests are welcomed. We're a candy company tucked away in the hills of Cave City, Kentucky outside of Mammoth Cave. Caves, Lakes and Corvettes. Kentucky Cave country information on the many things to see and do, Scenic drives, where to eat, where to shop, and events and festivals in the area. For over 140 years Historic Diamond Caverns has offered tours of Kentucky's most beautiful cave. Presented by state-of-the-art lighting, Diamond Caverns features intricate drapery deposits lining the halls in cascades of naturally colorful calcite. Thousands of stalactites, stalagmites and flowstone formations decorate the cathedral-like chambers. Welcome to Kentucky's Hidden River Cave & American Cave Museum. Our historic tour will take you through one of Kentucky's largest & most scenic historic cave entrances where two subterranean rivers flow over one-hundred feet below ground. You'll pass the remnants of a turn-of-the-century hydroelectric generating system that once supplied the town overhead with water & electricity. Kentucky Action Park and Jesse James Riding Stables is your one stop for vacation fun in South Central Kentucky. We have the largest variety of amusement activities of any place around! Mammoth Cave Adventures, located in Cave City, KY, is the first and original Canopy styled tour in the state. The course houses 2 separate courses that travel across 7 Zip Lines Spanning over 60 acres of rolling-high-ridged hills. A primary course of 5 ziplines and a secondary course that includes 4 ziplines and each course carries its own weight restrictions. The Lines will have you weaving in and out of deep green canopies and over lush open meadows, traveling anywhere form 600 feet to 950 feet at speeds of 20 to 40 MPH. In addition to the Zip Lines you will experience the excitement of walking in the tree tops with the 2 Sky Bridges or the exhilaration of being cast up into the air on a Giant Super Swing. Are you ready for The Last Step? Take a Leap of Faith when you Step off the 70 foot Mammoth Cave Drop Tower the ONLY one of it's kind in Kentucky. Come experience Park Mammoth Resort, a historic property that includes; restaurant, winery and wine tasting room, 100 guest room lodge, shooting sports, 18 holes of regulation golf and conference center located in the heart of the scenic Caves, Lakes and Corvettes region of south-central Kentucky. We welcome you with the comfort, amenities and warm, personal service that you expect from a first class resort. Lost River Caves are designed for Adults and Families, this tour includes a 20 Minute Guided History Walking Tour and a 25 Minute Cave Boat Tour. Your purchase price also includes a self-guided tour of our Butterfly Habitat (seasonal) and Blue Hole Trails. Conveniently located near Mammoth Cave National Park, Dinosaur World in Cave City, Kentucky is an attraction dedicated to the giants of years past. With over 20-acres to explore, you will find yourself wandering amongst some of the most feared predators ever to walk the planet. Dinosaur World offers a unique, natural setting featuring a lush garden setting and paved walkways where you will encounter a wide variety of dinosaurs representing many diverse and unusual species. Home of Mammoth Cave National Park! Since the early 1800s, Cave City has hosted visitors to Mammoth Cave, the second oldest tourist attraction in the United States. Mammoth Cave National Park is Kentucky's oldest tourist attraction, a World Heritage Site, and International Biosphere Reserve with 53,000 acres of natural preserve and the longest cave system in the world with over 4000 mile of passages and 400 miles of mapped passageways.